Another late match I had to stay up for, but luckily this one was as one sided as they get, and was over in a little more than hour. As I said in my Federer vs Del Potro post, Roger held a 9-1 H2H record against Blake, and barring bizarre circumstances I couldn't see him improving on that. The first service game from Blake pretty much set the tone for the match – it was poor to say the least. Roger didn't have to do anything other than get the ball in play and wait for an error. Federer held serve comfortably throughout the first set, and he wasted several opportunities to get the double break. However, it wasn't required and he served out the set with ease to take it 6-4. The first set was pretty much like a light training session. It's difficult to know if Roger was playing well, as he didn't need to, but he was serving well enough and hit a couple of nice forehands. Blake, however was playing pretty poorly – he served 3 double faults in the first set and you can't afford to do that against Roger. Other than a couple of crisp shots, the only real highlight for me was Roger showing great racket head control when he flicked a ball to a ball boy. The second set started very similarly to the first – with Federer setting up 2 break points, Blake managed to get back to Deuce but Federer converted his 4th of the game to break. Blake consistently let himself down in the semi-important points, double faulting at 15-30. A poor show really. In true Federer complacent style, he double faulted himself to give Blake a chance to break back, which he took with a powerful return of serve. Roger then broke straight back after Blake double faulted at 30-40. Testament to how badly he was serving at key moments. Fed held comfortably, secured the double break and went on to take the match 6-1 in the second. In the quarters, he'll face Berdych, who he leads 9-3 in the H2H, however he lost to him at Wimbledon last year and at the Sony Ericsson Miami Masters. Although he did win their most recent encounter at last years Rogers Cup. So on the face of it, it looks like it could be quite a tight match. Against James it's always a fast-paced match from start to finish. 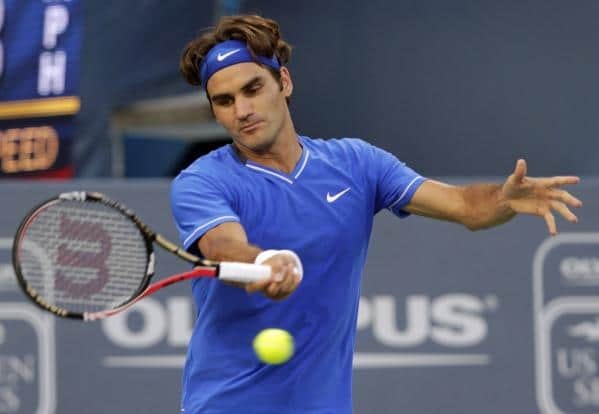 You hope you get on a roll and he doesn't,” Federer said. “I was able to counter his attacking style. I was able to play clean on my service games. In the second set he didn't play so well, and the score line shows that. So overall, a solid match from Federer. You can only beat what's in front of you at the end of the day. So by serving well, keeping the ball in play he did just that. He prevented Blake from finding rhythm which ultimately made him make too many errors. Despite losing 2 out of last 3 matches to Berdych, I'm backing Roger to win this in straight sets. Wimbledon was an upset, and Miami was a match he should never have lost. So I think those results somewhat flatter Berdych. I've always thought he was a good matchup for Rogers game, ok he can hit big off both wings, but he's a poor mover, lacks any sort of variety, is mentally weak and if he has to take his hand off the racket on his backhand side when stretching, his shots become innocuous. You only have to watch the 2010 Wimbledon final against Nadal to see how ineffective his game is. He was pretty clueless out there. So unless Shankerer turns up to the party and commits a ton of unforced errors – it should be a routine victory. Elsewhere in the draw Nadal got past Verdasco (or Fiasco as is probably more appropriate – courtesy of Ruan) in 3 tie break sets. I didn't watch the match, but from what I read on my twitter timeline, Verdasco should have probably won the match, but like usual, he served like a douche and threw it away like he's on Uncle Tony's payroll. Nadal plays Fish in the Quarters – and this could be an interesting match – Fish had chances at Wimbledon, but ultimately fell short – however over the best of 3 sets, with Nadal looking shaky on a quick surface, it could be Fishes day. It looks likely that if Federer gets past Berdych, he'll face number 1 Novak Djokovic in the semis, who's clearly on a great run right now. It'd be nice if Roger could get past Novak here, and I'm sure he could on this surface. But even if not, this will have been a great warm up for the US Open regardless of the outcome. Good match but as you said it was so easy. And match without real oponnent is not very interesting for Rodg. At least he did some good shots. Good luck to Blake. I really appreciate this guy. Indeed, it was pretty dull. Wow. This blog is really good. Can’t believe I have only just come across it! Your views on Federer, all be it a bit biased, are very accurate. How do you rate his chances at Flushing Meadows? Personally, can’t see past Nole, and with the way the ATP set the draw,it would be against Murray in the final.